A beautiful earrings in meenakari in green and blue with the lovely floral design. The beauty of it also lies when you wear it with the green beads. A beautiful pair of green onyx silver earrings in the right size. Perfect to wear on a casual day out! A perfect silver statement stud in a round shape. Perfect to wear for a party! Sometimes jhumkas look awesome when they are tiny. 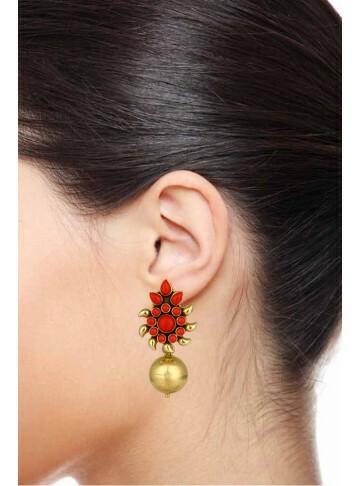 Just the right size, this small jhumka is perfect to wear to work or on a casual day! A lovely long silver earring with green and red onyx stones. A Chandbali in a tribal style that’s perfect for your everyday wear. 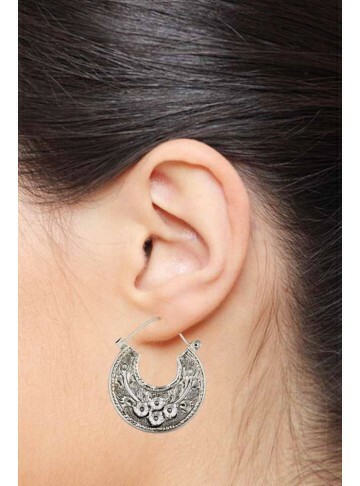 If you love plain oxidized silver, this tribal earring is the perfect match for you. A lovely blue turquoise jhumka earring in oxidized silver with a floral design. The Indian peacock always keeps coming back. The beauty of this bird is depicted beautifully in this simple and elegant silver stud. A lovely blue Meenakari jhumka earring with a floral stud. Truly a statement piece! A simple yet elegant peacock silver jhumka earrings you can wear with your ethnic outfit! If you're looking for a earring that isn't too loud, this pink spinel oxidised silver earring is for you. The small dome at the bottom of the earring add to its beauty. The perfect turquoise drop earrings in silver to add to your collection. The mesmerising blue stands out beautifully when worn. Simple and elegant silver earrings with a lotus flower. Wear it on a casual day out or to office with your traditional outfits. A petal shape meenakari silver drop with red floral enamel work on it. Tiny yet eye-catching, these earrings are definitely something you must own. 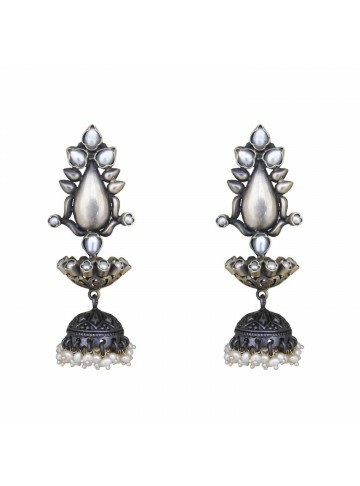 A lovely silver oxidised finish bali earring with tiny hearts carved around it. The perfect earring to wear to office on a work day. 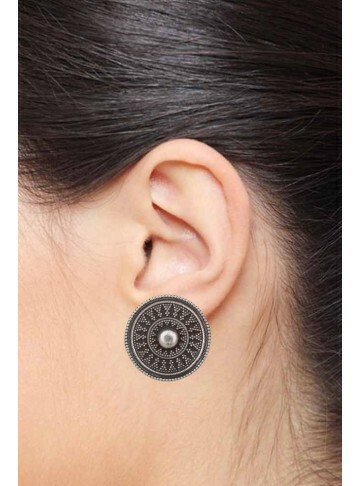 A round shaped flattened disc shaped stud earrings that will go perfectly well with your work attire everyday. The chandbali that is sure to make a statement. 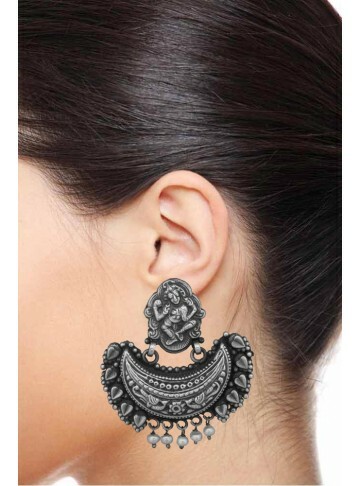 In an oxidised finish, with floral etchings all around it this one is definitely something you want to own. Wear it with your westerns or Indian wear, you can still look fabulous. The cutest fairy silver studs that is sure to bring a smile to your daughters face. She so wonderfully sits on the black onyx stone.The best part is you could wear them too! An exquisite pair of bouquet studs handmade in 925 silver. You will love it for its uniqueness! A nice pair of earcuffs in a shape of a butterfly that can be clipped on to your ears easily. Perfect for a sunny sunday morning brunch! A beautifully carved rose in silver is the perfect stud earring you can gift your wife. Lovely circular drops etched with a floral design in a drop shape. Perfect for everyday wear! Beautiful shell shaped stud earrings with a pearl in the centre. Beautifully crafted, these pearl studs will a lovely addition to your jewellery collection. 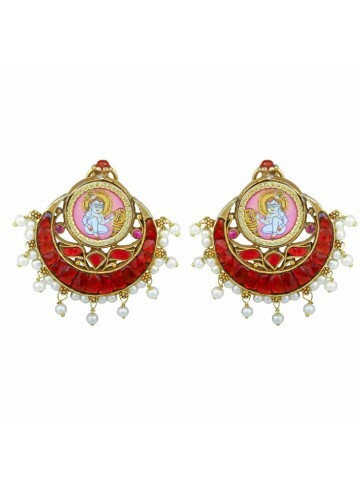 The most stylish earrings ever made, these disc shaped pink pearl earrings falling from a string are adorably cute. Wear it with your westerns on a date or a casual day out. Lightweight yet glamorous, you can never go wrong with pearls. A nice pair of handmade floral studs in a lovely shiny silver. Perfect to wear everyday to work.